I have a LP tank that seems to have a brittle/broken o-ring seal in the valve. My question is "is this something owners can fix?". I seem to remember being able to replace o-rings in the old style valves but don't know about these new valves. Anyone replaced one on the new style valves? "If you are talking about the spring loaded plunger type seal inside the OPD valve, it is considered part of the valve, and is not replaceable. Normally if you mess up that seal, the complete valve must be replaced. The seals can be removed w/ a dental pick, and new ones installed,.......if new ones were available, which their not,....or so say the propane guys." Gary, Thanks for looking. I tried with no luck. Guess I'll have to loose the full tank, if they can't pump it out, and get a new valve. Also will double check the other tanks I have here to make sure they have good rubber. Something else to add to the checklist of things to do. Maybe I am talking about what would be considered part of the valve but it is right at the entrance to the valve. Here is a picture of what I see. You can see the black rubber seal and some of it has broken off and is resting in the internal threads. 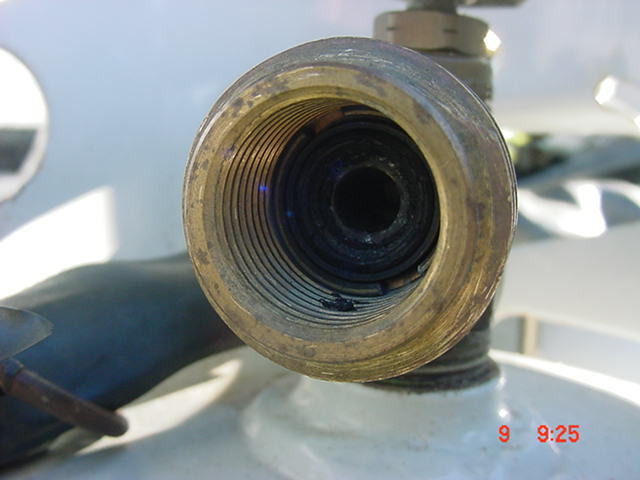 That rubber seal in the valve sets against the taper of the hose valve and is needed since the metal to metal seat is not enough to hold the gas otherwise. It looks like I need to replace the valve, or the tank. I hate to loose the gas in the tank since it is almost full but whatever it takes to be safe. I can run down to Walgreen's and get newer tanks. Both of these are going on 12 years old. Need to be re certified anyway so new would be better. I looked at mine yesterday after you said you had a wiggle in yours since you put the new regulator on. I was trying to figure out how you where getting the wiggle. Mine has almost no wiggle in the hose. I can force it only the tiny amount of the clearance of the hole in the green nut and the brass hose fitting. Almost nothing. Now seeing your tank valve sealing gasket, I see the problem. Mine looks nice and fresh and conical inside to accept the fitting on the new green nut. You and your prior owner have been using the older style POL left hand tread fitting on the newer style tank with the OPD Acme/left thread combo fitting. The older POL will screw inside the newer fitting. However the older POL fitting was more of a mechanical fit. In fact some of the very old ones where all brass on the male taper. In later years they added a small O ring in the male taper. What may have occurred is for so many years using the older POL on the new style OPD valve, the rubber seal has been crushed and deteriorated. As you can see from your new green nut, the new OPD is more of an O ring type of seal. It is not brute mechanical pressure like the old POL. In fact you cannot over tighten the green nut to try and make the seal tighter. There may even be a spring behind the seal to create a known constant force against the seal. Odds are high both of your tanks will have this problem of a crushed/deteriorated seal. The LP transfer, if you have an real LP refilling service, not the local garden shop, they may be able to transfer the gas. They also sell a complate new OPD valve. They can re-certify your tank and put the new valve in. However with the cost of 20# BBQ grill tanks now a day it may be cheaper to buy a new tank. Don't know but something to check if you want to save a few dollars. I do not believe they still make that type of valve any more they are all now either all brass or brass with and "O" ring. I believe your adapter will work on any tank so it maybe best to trade your tank for a newer one your only problem is your full tank. Thanks Jim but I think I'll not try to transfer myself. Before I blow myself up I'll let someone else to it. JohnB, The swivel I talked about only happened to this one tank that leaks. I see the difference between the old and new styles and yes we did use the old style which you can see in one of the pictures I posted about the regulator installation, I think. Since there is nothing special about these tanks I will probably buy new BBQ grill tanks and move along. Gary, I have a adapter like that but without the quick connect. I may take this tank for our grill and use the gas out of it and then just chunk it or make a portable air tank with it. Mainah, I can see a trade in my future. I think I have solved the full tank problem with the old style adapter. Thanks everyone. Small problem, fast solution and nobody got hurt. That's a good thing. thanks jim. Home Depot is only a few blocks from here. Will check them out when tanks are empty. I discovered that using a POL fitting on the new style tank valve has crushed and misshaped my seal. I was trying to put it on a new patio heater after getting it refilled. The patio heater has a new standard RH thread outer plastic nut instead of the internal LH threaded POL. The plastic nut bottomed out, and the seal was still not touching the brass center of the hose connector. Yet the internal valve was depressed and copious gas was venting from the coupling. Examination of the seal revealed that it is housed in a LH threaded brass cup with spanner type indentations on the top/outer edges. I used a small straight screwdriver to remove by alternately applying pressure on each side. Remember to turn it clockwise to loosen as it is in the POL LH threads. 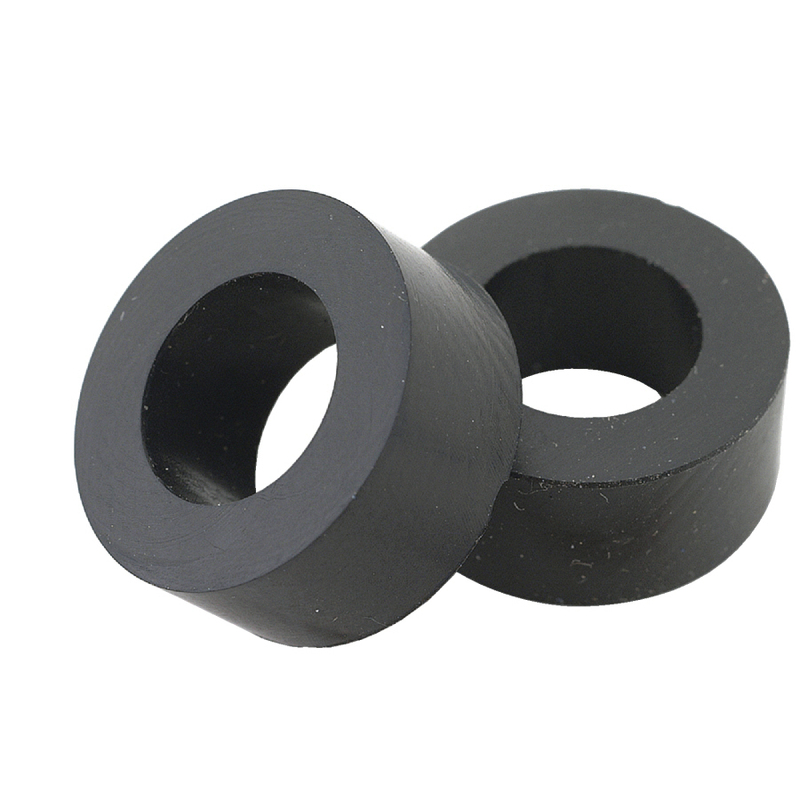 Behind the cup is a seal that is not part of the large rubber piece we need to replace. That rear seal is for the spring loaded check valve. I removed the spring with check valve disk and actuation cup as a single piece, inspected and replaced into the original position with the tank lying on it's side. Remove the damaged or cracked rubber seal from the brass cup carefully with a small pick or screwdriver or knife. I decided to cut mine out with exacto blade to avoid damage to the brass cup. Replace with Kohler Rubber Bonnet Packing number 93 from Lowe's store -- part number SC0093 and SKU #174671. A 2-pack costs 87 cents. It is an exact fit. Replace the assembled cup with new rubber seal in the counterclockwise direction. Make sure the check valve lines up and comes through the seal as you tighten. Stop when the brass cup bottoms out. 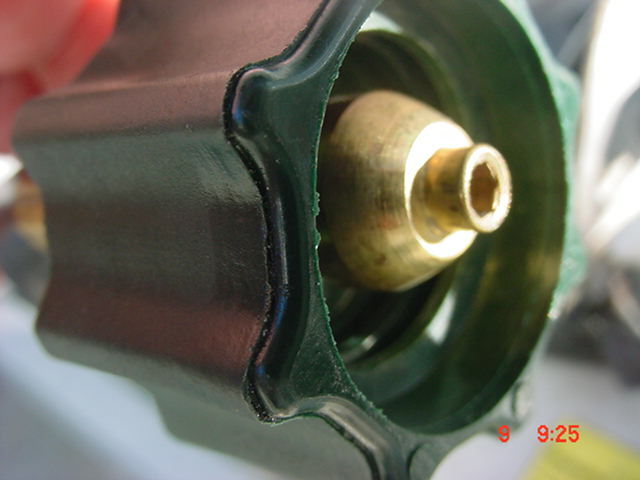 The rear seal mates to the original POL flare surface in the brass valve body. I imagine there are several manufacturers of tank valves. This solution may only work with one brand. I recommend you remove the brass cup if you see the detents on the edge above (higher than) the seal. Otherwise you needn't buy these packing washers.